As we read through various articles about the contemporary “psychic” phenomenon, most penned by journalists lacking much knowledge about their subject, there is a realization that people are confused as to what right-brain functioning is all about. When we read stories about psychics, the writers often expect these people to have clear visions of future events, something very rare, indeed. While we all have heard stories about people who have strange intuitions and refuse to board a doomed ship or aircraft, these are not true prophetic visions, but rather they are a sense of foreboding that is our inner-self warning us of looming danger. The true prophetic vision is achieved only by a prophet, and throughout history, these gifted people have been few and far between. Indeed, many would-be “prophets” have crawled from the cracks in recent years, all of them issuing warnings of the “end times” events that they say they see coming upon us. The Internet is filled with their web sites, many of them promoting the sale of books that claim to be filled with details of visions of apocalyptic events. Many of these writers are basing their prophetic visions on interpretations of Bible prophecy, and all of that was written thousands of years ago. Those visions, by real prophets in their day, are vague because the “seer” failed to recognize what he or she was looking at. It would be like picking those people up from the time in which they lived, and plunking them down for a few brief moments in the heart of a modern city and expecting them to understand what they were looking at. Then there are the map-makers, people like Gordon-Michael Scallion, Lori Toye, Aron and Doris Abrahamsen, and Mary Summer Rain who claim to have had visions, or talked to someone who had such visions of the United States following some great future catastrophic event. All appear to show less land and much more water, which appears to be coming true because of the melting of the polar ice caps. Of these, Mary Summer Rain’s prophetic book, Phoenix Rising, based upon interviews with a blind native American woman named No Eyes, who looked upon the world with her third eye, appear to already be coming startlingly true. No Eyes told of labor strife, of nuclear power plant disasters, and other events marking the future of the United States. All of the contemporary “prophets,” however, are yet to be proven as true visionaries of future events. The maps, for example, predict that major portions of the United States will just sink down into the sea, much as Atlantis was said to have been lost in the ancient past. There is a difference between a prophet and a psychic. A prophet is capable of predicting future events with great accuracy. 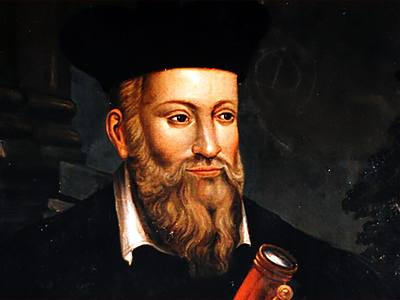 The last known prophet was the French physician Nostradamus, who foretold of the death of kings, and many believe he saw far into the future and that his poems, published in the 16th century, described current events. There have been many lesser-known prophets, people who rise up from common stock, who have made startlingly accurate predictions about future events, yet never gained fame nor fortune because of what they saw. Such a man, Matthias Stormberger, a German cow herder who lived in the early Ninteenth Century, accurately described the looming world wars and some catastrophic events that may yet be ahead of us. You can find his story on this site. The psychic, on the other hand, is identified as a clairvoyant, or a person who has visions about things that are secret and out of view. A wonderful example of a psychic was Edgar Cayce, who found cures for a wide variety of illnesses, interpreted dreams, spoke of philosophy and reincarnation, and wrote volumes about the visions he experienced while he slept. There are many people claiming to have psychic powers that range from accurate tarot readings and palm readings, to dreams, mental visions and remote viewing. Some of these people possess real gifts, but many of them are con artists out to get your money. Beware the psychic that charges for his or her information.